I really REALLY love today’s wedding. 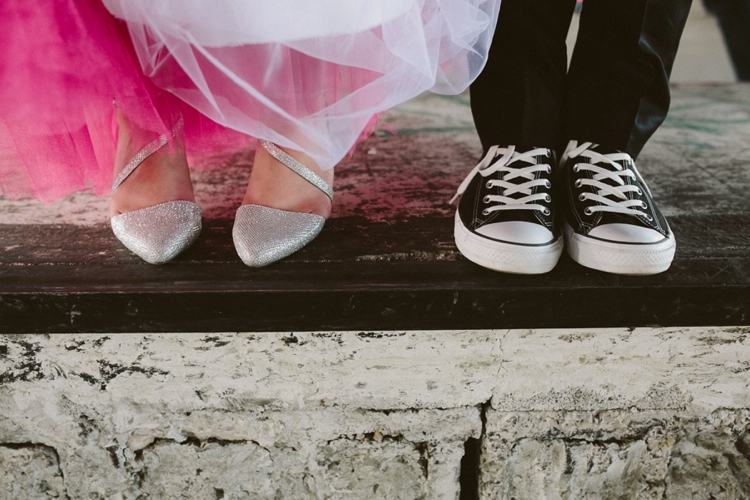 I mean how can you not adore a wedding that includes Jazz mixed with Japanese pop and Disney tunes, a Star Wars wedding cake, Pokemon Pokà© Balls for ring boxes, and an astonishing bride with a hot pink petticoat and epic My Little Pony trainers (plus several more shoes changes!). 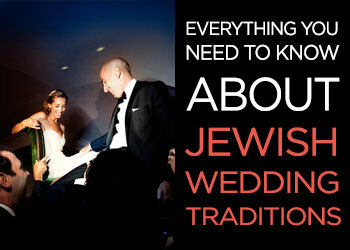 This Jewish wedding has heart and personality at it’s core and I absolutely love it. Today’s bride has monumental style and really knows her own mind… Anyone who is considering stepping away from the white/ivory/champagne norm — I hope this wedding gives you the confidence to do so! There are so many fun creative touches. 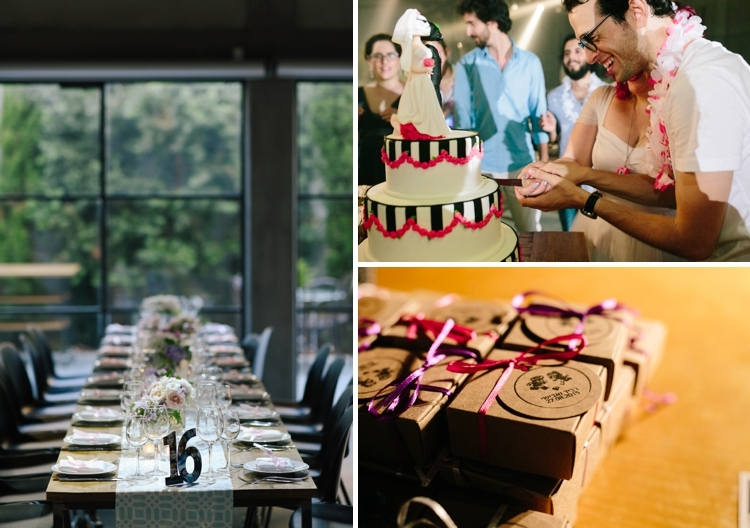 Take the bride’s oh so pretty floral crown and her glittery 50’s make up and the cat magnets designed by the bride, as well as rustically styled tables (proof that you don’t need to go overboard to make something look absolutely gorgeous) and the creative cartoon-style table numbers and… oh I could go on and on and on. What a wonderful glorious mix! 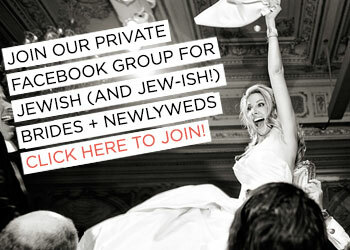 Come on and have a peek and enjoy the images by Noa Magger plus the film courtesy of Shahar Lev. 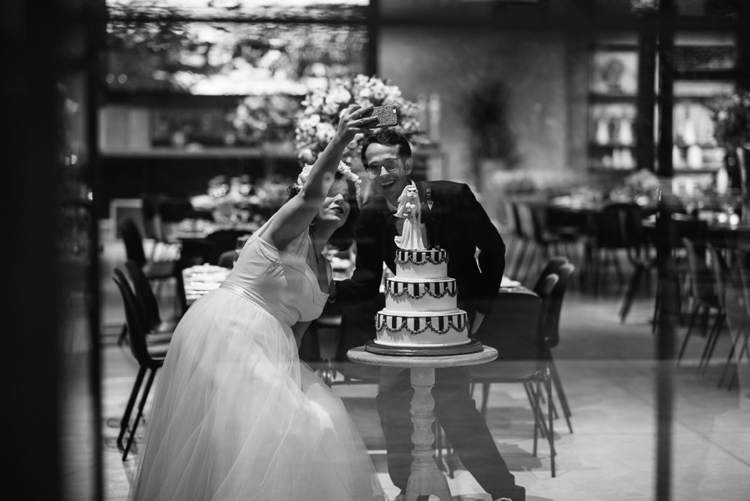 Ravid, the Bride: We actually met at…….. McDonalds! Some eight and a half years ago. Avishai was a cashier and I was a cook, and we also used to work opposite shifts. I was dating someone else at the time. Somehow we ended up on the same shift one day and clicked right away. He did all he could to have me break up with the other guy(!) and our boss, who saw the chemistry, kept suggesting we should go out. 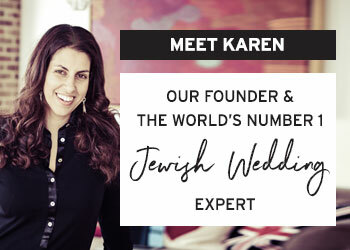 When we actually let our boss know we were dating he exclaimed ‘well finally’ – I guess you can say we owe this to him (and he was also a guest at the wedding – we’ve even introduced him to our parents!). We went to a movie the day I broke up with the other guy, and it was really a love at first sight. We survived my time at the army as well as his, and went through a lot together – and now we’re married… I’ll stop being a walking cliche now! 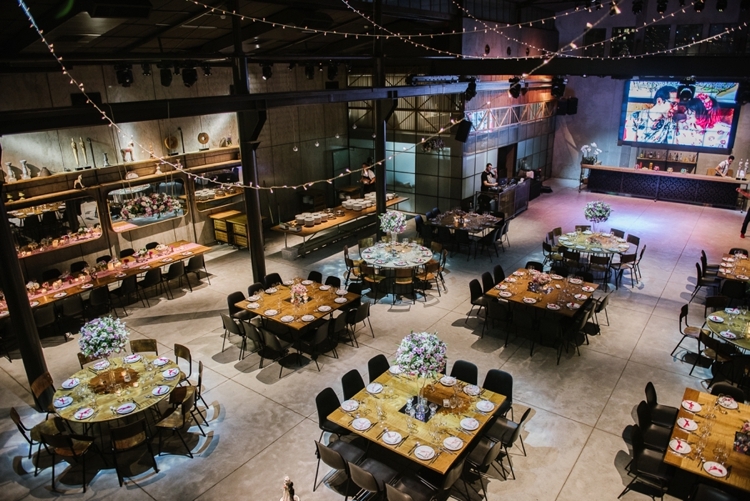 We got married at the East venue in Tel Aviv, an urban hangar which used to be a factory owned by the national electricity company. 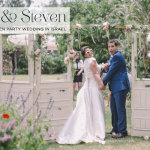 We knew two things before we picked the venue: we wanted it to be urban and fresh (not a garden of any kind), and we knew we wanted it to be in Tel Aviv. 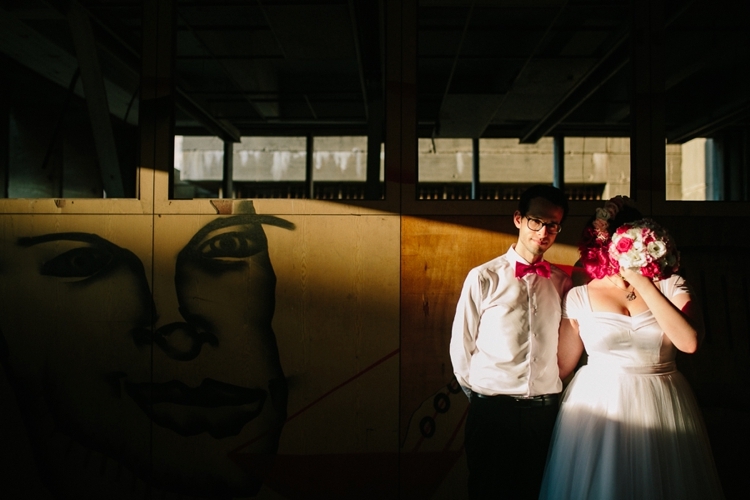 We found East, which was not only the coolest place for a wedding, but was also in walking distance to our apartment! We felt like it was a match when we first set foot there. We also knew that we were aiming for a summer wedding. Summer in Israel is terribly hot, so it had to be somewhere with an option for air conditioning and dancing in a closed space. So the chuppah and reception were outside (we handed out fans for people to survive the heat), and the rest of the evening was indoors. 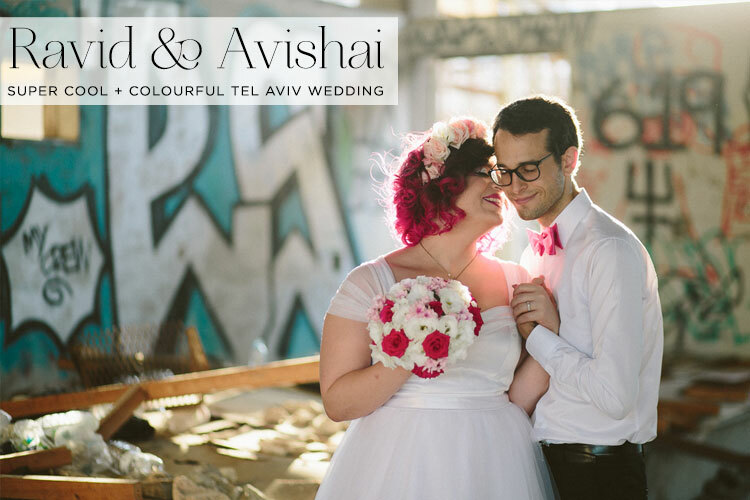 Choosing one single theme was hard, so we decided to create one — ‘Ravid and Avishai’s ball’. Of course we only called it that behind closed doors 🙂 We didn’t want to compromise on anything we love, so we just mixed it all together – Star Wars, Pokemon, Japanese boy bands, Disney movies, Scott Pilgrim, Harry Potter… everything was there. I guess you can say it was a geeky theme. 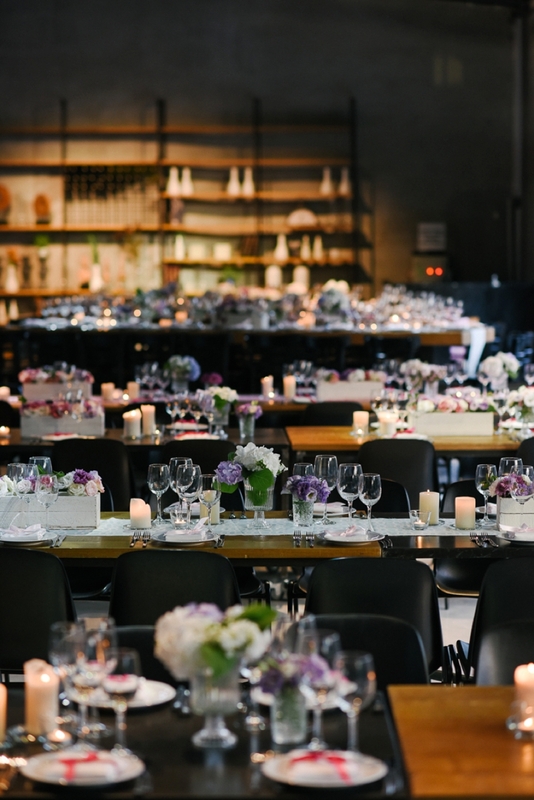 We wanted the entire event to have a ball-ish feeling, kind of like a Cinderella ball maybe? Like a really glamorous event which was also very ‘us’. 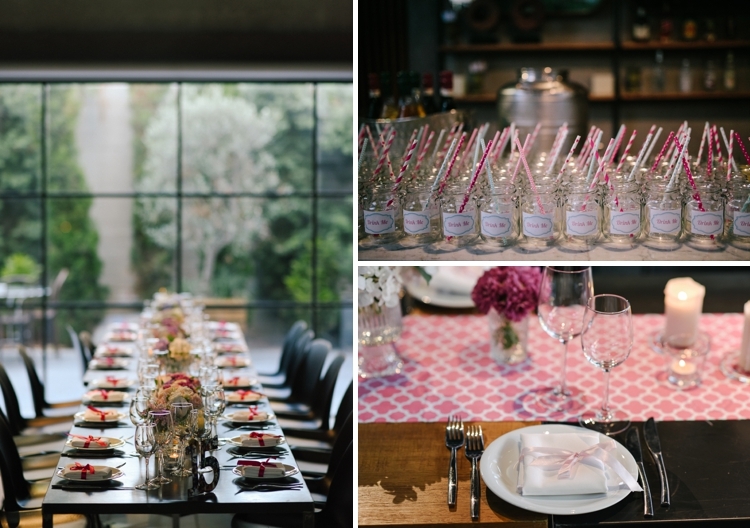 Our colour scheme was – well — pink! Also white, light purple, peach and a little black. 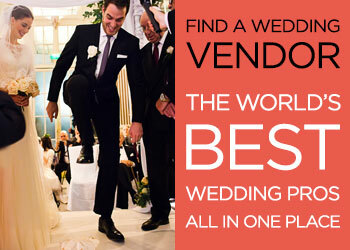 We used a wedding planner, called Ever After, who figured us out right away and helped us find the most amazing suppliers for our perfect wedding. I designed the invitation myself, and it featured 8-bit figures of Scott and Ramona from the movie/comic-book Scott Pilgrim Vs. The World. This comic/movie has a special meaning to us, as we used to laugh this is a movie about us — we even went as Ramona and Scott to several fancy dress parties! This also went well with the entire ‘geek’-ish/’us’ theme of the wedding. Indeed, when people got the invitation, the most common reaction was “this is so you”. 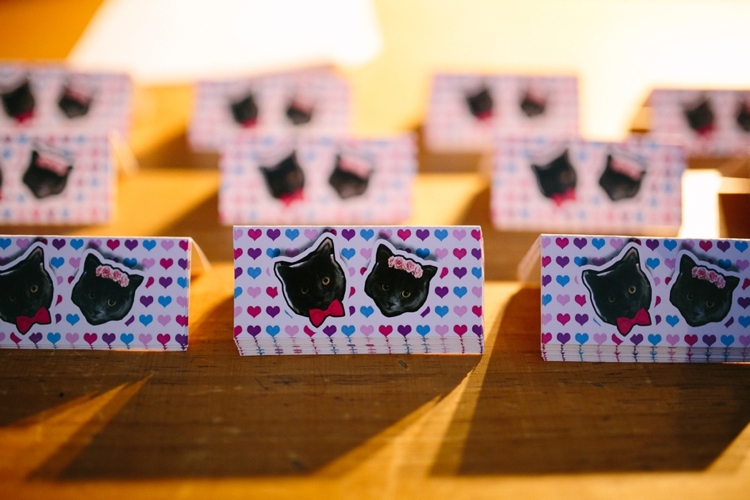 With the invitation we also handed out magnets that I designed, which featured our two cats in bride and groom attire! The magnets had the date, time and place on them. This was an issue from the start. The idea/feeling I got from the wedding industry (and really, from ‘normal’ make-up artists), is that I should go for natural looking makeup, and if I do decide to go for a bold eye look then the lip can’t be bold as well (and vice versa), etc’. As a girl who will not step out of the door without a perfect winged eyeliner and bold lips, I knew I couldn’t go with a natural look on my wedding day. 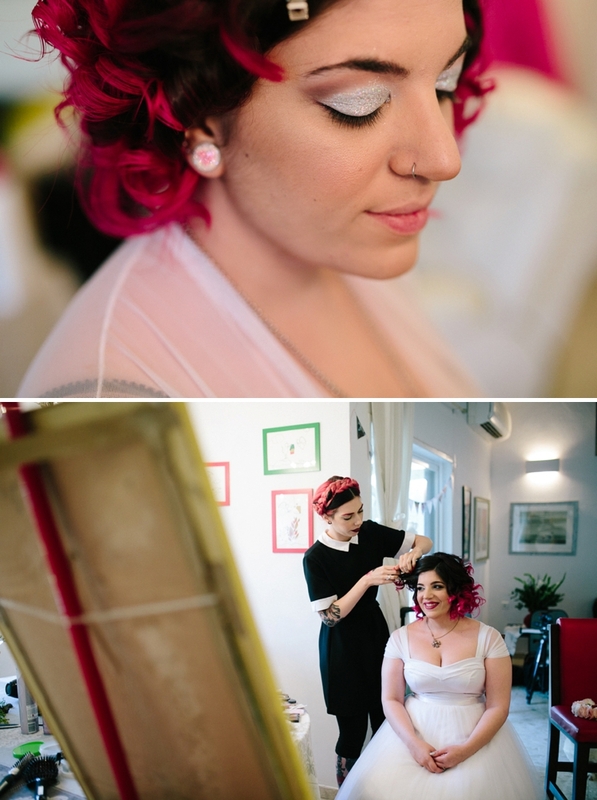 After trying a few make up artists, I found Dafna Bar-El, an amazing make-up artist who specialises in 50’s and pinup hair and makeup. We had a click right away! In the end, we went with a bold look, a glittery lid (glitters are definitely an obsession of mine), and dark pink lips. As for the hair – my signature pink hair was not going anywhere, of course! 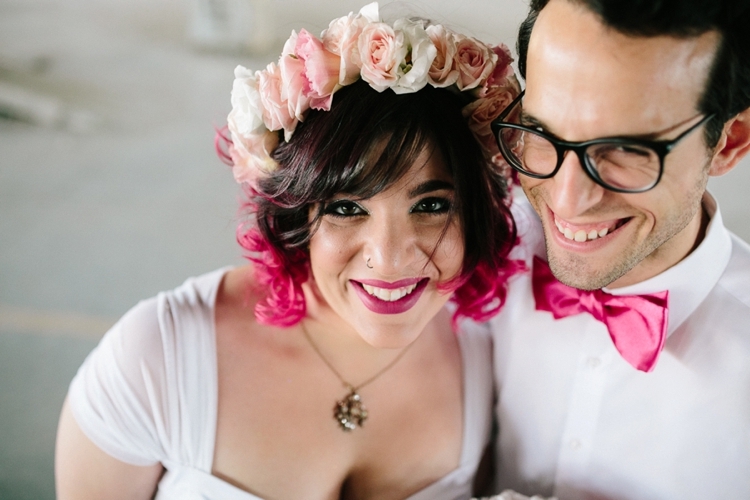 The pink in my hair matched the pink of the dress (and the bow tie of the groom), and I had my hair curled. I knew how I wanted my dress to look like, it was just a matter of finding the right people to have it made for me… I knew it was going to feature a colourful petticoat and be princess-like, but not all too much. I visited to a few boutiques before discovering to the studio I went with — two designers from Tel Aviv named Tali & Marianna. They thought my idea was great and that they could execute it, and I felt comfortable with them, so we started working! (we made it from scratch according to my order). 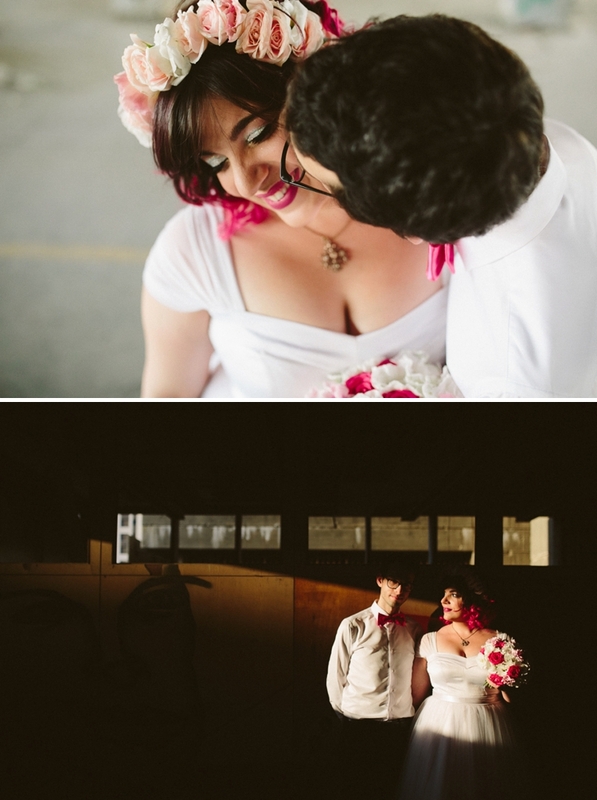 I wore a flower crown which I knew I was going to use, as I walk with flower hair bows all the time – it felt natural. Throughout the day I was wearing a necklace which is a family heirloom – it belonged to my grandmother – she got it from her husband’s mum, and my mother also wore it on her wedding. 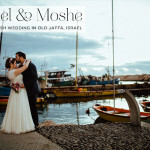 It meant a lot to me, because one of the reasons we decided to get married was to have my grandma there – she got very ill a few months before our engagement, and, as I was very connected to her. It was really important for me for her to be there – or at least know it’s happening. When my mum offered I wear the necklace it was a no-brainer. After the chuppah I took it off and changed to a My Little Pony necklace I made with an old figurine, and actually wear it almost all the time. I started with skyscrapers, moved to lower heels, and then flat sneakers! I ordered my My Little Pony boots online. They’re amazing and also very dangerous! They were a dream of mine, so it was only logical to buy them for the wedding! 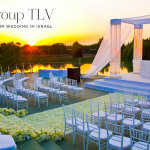 During the reception and chuppah I was wearing low, silver, glittery heels, and then moved to white sneakers for the party – which had LED lights around the soles and were definitely and eye-catcher. I wasn’t going to be a bride who changes dresses, but why not shoes?! We chose a simple, black suit together (he didn’t want any other colour, actually), but as we had to feature some colour in him, we went with a matching pink bow tie. Of course he wore his black Converse sneakers, as he can’t go on without sneakers! 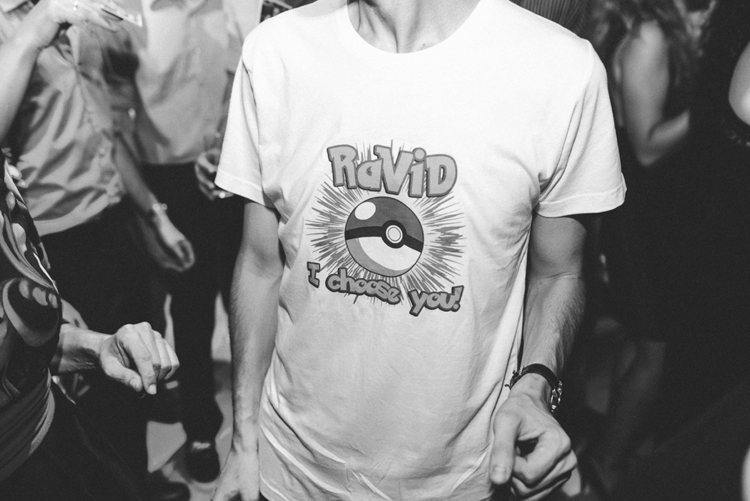 After the Chuppah he changed into a T-shirt we’ve designed together, saying ‘Ravid, I choose you’ with a Pokeball. 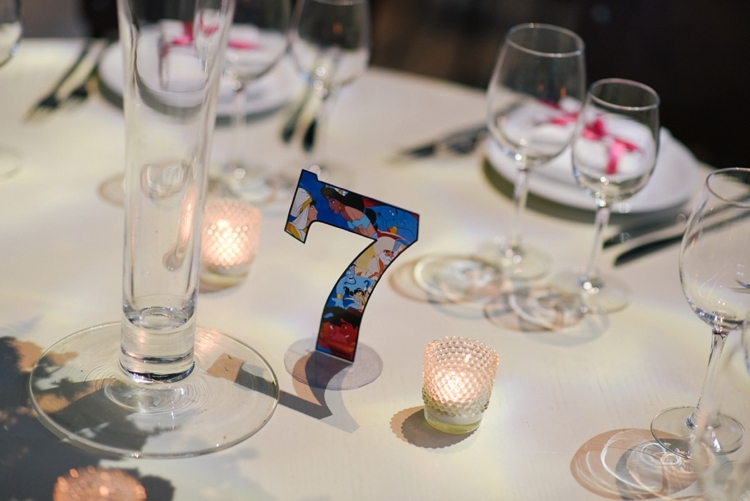 This was part of the pokemon features of the wedding – this, as well as the rings which we kept in a Pokeball. We wanted flowers to go with the colour-theme, but nothing too heavy. 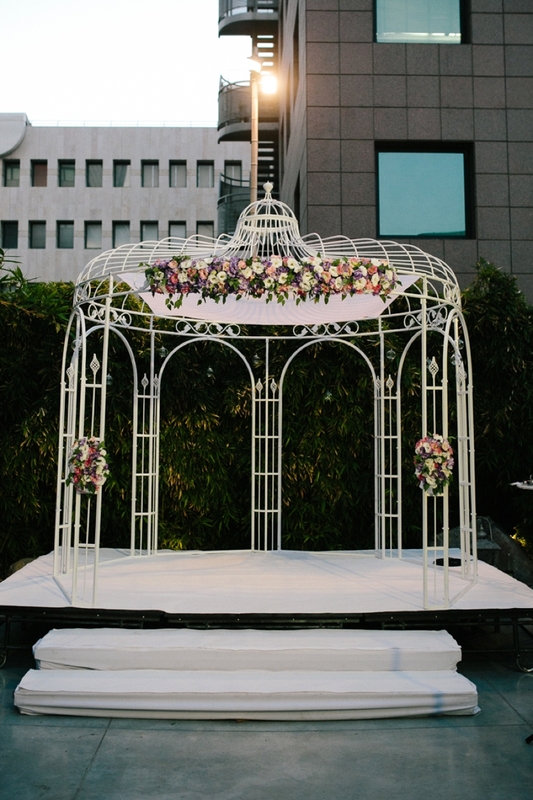 We had the event designer Moran Carmeli involved and she was in charge of the flower arrangements and ceiling decorations, so she also took care of the chuppah design. 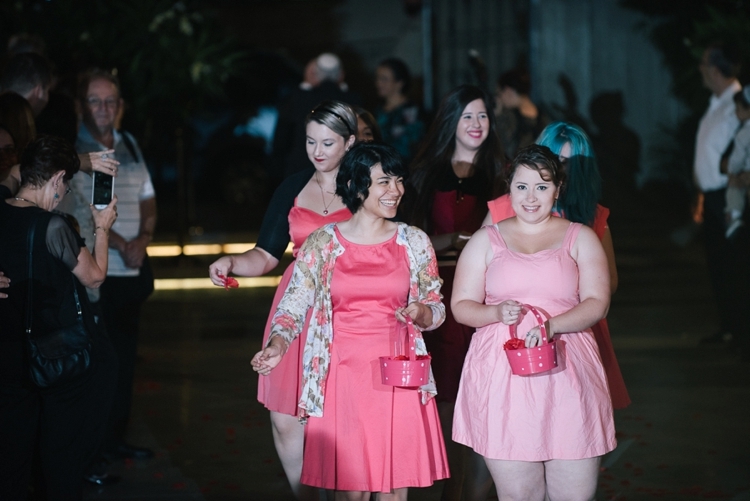 I had my best friends find pink dresses for the wedding — but we never organised a collective purchase or anything — so they all had different shades of pink. The ceremony was held by a Rabbi who was close to my husband’s family, and he is also the Rabbi of the hospital my grandma was hospitalized in at the time of the wedding, so it was all really touching for us. 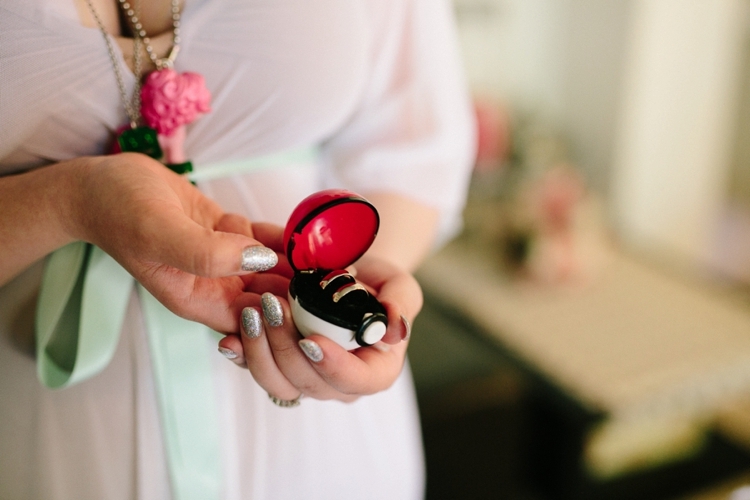 I also wanted to give a ring to my husband, which our Rabbi allowed. 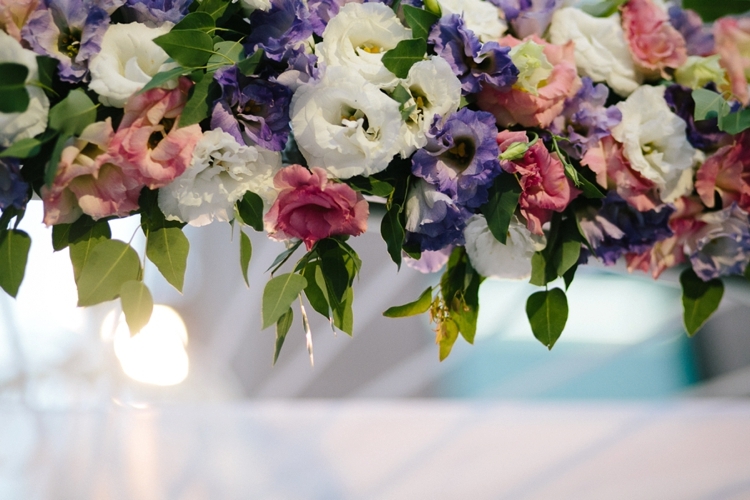 As I’ve mentioned above, our designer Moran Carmeli was in charge of flowers. As I don’t really know a lot about flowers, I picked the colours and left the rest to her. My bouquet was made by my best friend who also works as a florist, and was a special gift from her. It was designed in pinks and whites in order to match my hair and dress. 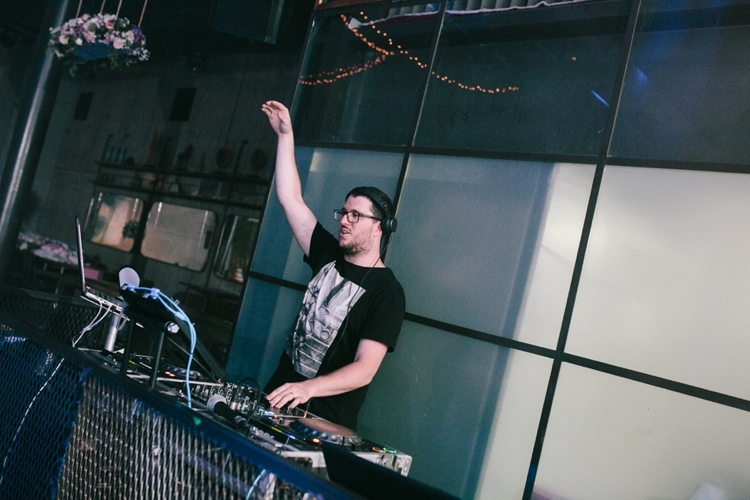 Since we both have a very particular taste in music, it was important for us to find a DJ who will get us. We know we had to have a crazy 90’s-2000’s pop/rock party with touches of electronic and dub step (crazy, right?). I also really wanted to feature some songs of my favourite Japanese boy bands! 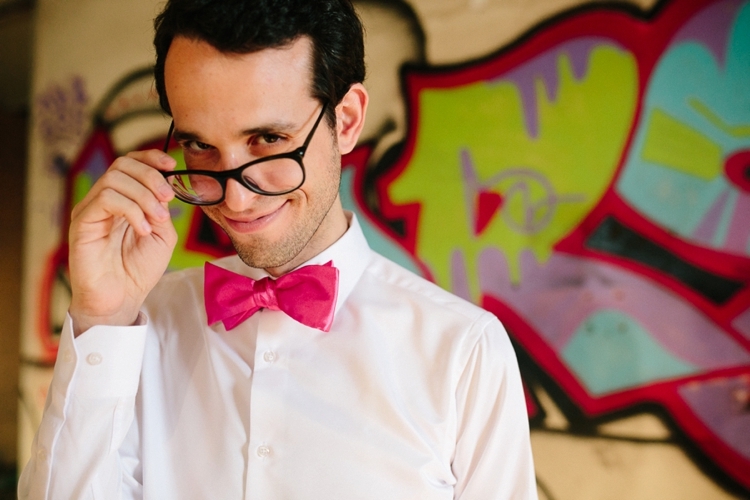 We found DJ Udi Bletter – which we knew is our guy after just one sitting (where we sat and listened to Britney Spears and Prodigy). 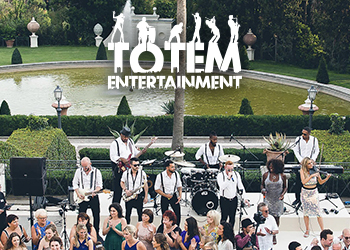 For the reception, we wanted Jazz tunes and Disney music – both of which were played and were amazing. Our song for the first dance was Let Me Be Your Wings from Thumbelina, which is a special favourite of mine and was very emotional. Yes, yes, yes. I knew we were going to have a Star Wars cake. It had to be. I designed it and sent it to our cake-maker, Nemashim Cakes, who was suggested by my best friend – and she said she can definitely take care of it. 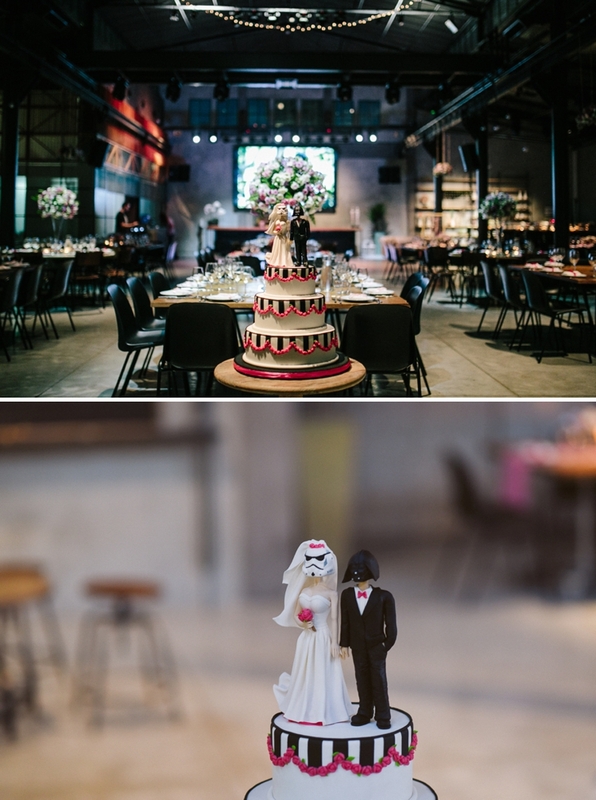 I designed the cake topper to be of a bride and groom (of course), the bride had a Storm-Trooper helmet and the groom a Darth-Vader helmet – an homage to the actual helmets we have at home and also took engagement photos with. The figures also had our clothes – including the pink petticoat and bow-tie. It was a chocolate cake, and delicious! The venue was in charge of the actual catering. As you already know, our photographer was the wonderful Noa Magger. We’ve seen her work and loved her natural, special looking photographs, and we also fell in love with her amazing character and mood when we met her, so we knew we had to go with her. Our videographer was Shahar Lev. We saw her work and really loved her footage and editing. She was also a sweet and cool person which felt like a match. Both Noa and Shahar were amazing, easy-going and calm and we had the best time spending our day with them. My family made us a surprise-video which was amazing and very touching. They called us by surprise to sit in front of the main screen and played it – we were really overwhelmed. 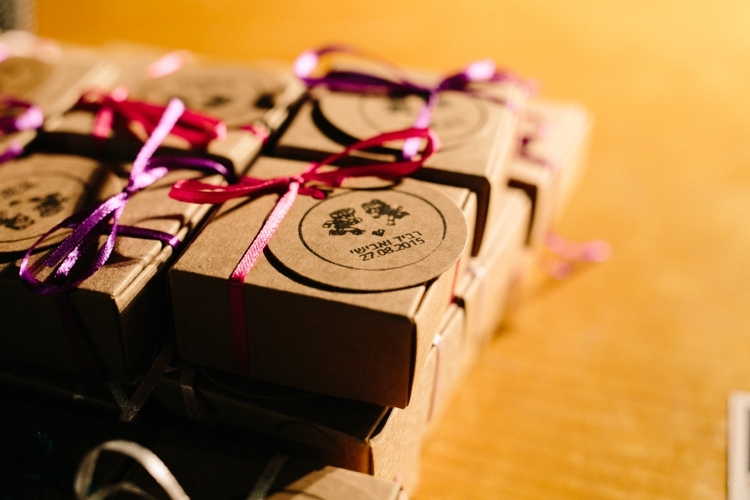 I’ve made small boxes with some candy, with a ribbon and tag on top – it had a stamp of Scott and Ramona with our names and wedding date on top. Took a while to assemble everything – fold the boxes, place candy and wrapper, then tie the bow and tag… I had some help from the husband and best friend though. We started the day at my mum’s house with my twin sister and her with me, and some other family members. As I’ve mentioned, my grandmother was hospitalised for a while now, so we know we had to go visit her at the hospital. After I was done with getting ready and my husband picked me up, we went to see her before the photo shoots. I feel like she was really excited and touched to see me in my wedding dress, as this was very important to her. We didn’t spend there long, but I’m so happy she got to see us on this special day. Looking back now, I think it was probably the most important part of the day; unfortunately, she passed away two days after the wedding. It feels as if she waited for the right time, and that she waited for us. It’s amazing how we were able to contain both tremendous joy and terrible sadness during her Shiva (mourning period); meeting people that were just there for us during the happiest day of our life, now here talking about how she kept strong to keep the family together. It’s a really important thing I take with me ever since. I think the best advice is to really take a deep breath and try to relax, and just have things happen and roll with it. Things will never go 100% according to plan, but in the end you won’t even notice it. The day went by so fast and I enjoyed every single second of it – it’s really hard no to. Remember this day is about you and your special person starting a new life together, and be happy! Great post on a very important subject!